How Do These Boats Sail Faster Than the Wind? 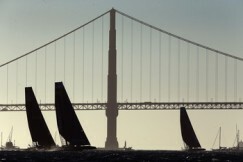 The America’s Cup sailboats are sleek and fast. 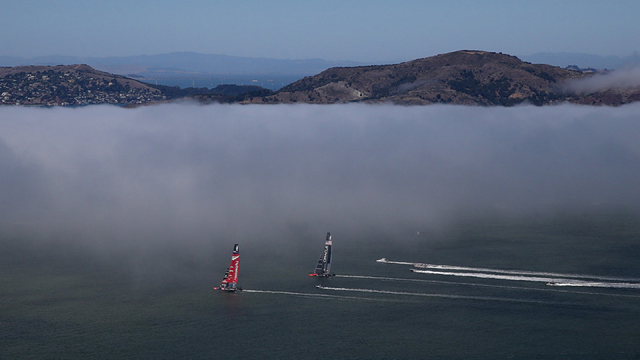 The AC72, the type of catamaran used in this year’s race, can travel almost three times the speed of the prevailing wind. 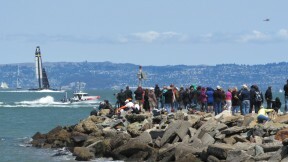 On June 18th Emirates Team New Zealand recorded a speed of 50.8 mph (44.1 knots), with a wind speed of about 18 mph (15.6 knots). Wind is the only thing powering these boats, so how can they go faster than the wind blows? In other words, sailboats are not actually creating their own energy (no, they’re not violating Newton’s second law). They’re harnessing more than one kind of wind, and they’re doing it like a jet harnesses the flow of air to fly. Everyone has felt this second kind of wind. It’s what you feel when the air is still and you head off on a bike, or a skateboard. You build speed, and it doesn’t take long before there’s a wind on your face. This is called apparent wind. True wind is what you feel when you’re standing still and the wind is blowing. The wind an object feels when it’s in motion is apparent wind. Sailboats utilize both true wind and apparent wind. One force pushes the sailboat, and the other force pulls, or drags it forward. True wind always pushes a boat. If a boat sails absolutely perpendicular to true wind, so the sail is flat to the wind and being pushed from behind, then the boat can only go as fast as the wind—no faster. That’s not because there’s no apparent wind; it’s because the apparent wind can’t help the boat when it’s hitting flat against a big sail. But when the boat travels at an angle to the true wind, the apparent wind suddenly generates a powerful force. “The wind is doing two things,” said Margot Gerritsen, an engineering professor at Stanford. “It’s pushing, but there’s also a part of this wind that is dragging. That dragging is done with this force called lift." “Lift,” in the case of a sailboat, doesn’t mean “up” although it does in the case of an airplane. In fact, the physics that allow an airplane to fly are the same physics that allow a sailboat to travel faster than the wind. The difference is that airplanes lift up off the ground, and sailboats lift parallel to the ground— as if they’re flying sideways. You can feel these two kinds of lift when you’re riding in a car (we suggest not performing science experiments when you’re the driver). Put your arm straight out the window, palm down to the ground like an airplane wing. Now tilt the palm of your hand very slightly up; your arm will rise with the force of lift. To feel what happens in a sailboat, put your arm out the window, bent 90 degrees at the elbow, with your palm facing you. Now angle your palm open to the wind very slightly; your arm will move away from you, as the force of lift pulls it sideways. Lift is simply the name of the force that’s generated when apparent wind bends around the outside of the sail. Air traveling on the inside of the sail is moving slower than air traveling around the sail, which creates a pressure difference. That pressure difference generates lift. The hoist you might feel under your feet when an airplane first takes off is not so different from the jostling sensations of push and drag that sailors feel maneuvering one of these catamarans. The AC72s also use lift when foiling, which is when the two hulls of the catamaran raise off the water and the boat is almost literally flying, with only the rudders and a board anchoring it to the bay. Foiling makes the boat even faster because the drag forces slowing the boat down are now mostly in the air instead of the water. If it’s physics that explains how the America’s Cup boats can sail faster than the wind, it’s the skill of the sailors and the design of the boats that give Emirates Team New Zealand or Oracle Team USA the edge, as they race toward the finish of the 2013 America’s Cup.